Recently, I finally got around to take all the old cameras from our family and took proper photos of them for a little series of posts. This is where it all began: my grandfather’s Voigtländer Brillant, the 6×6 camera that he got sometime in the mid-1930s. 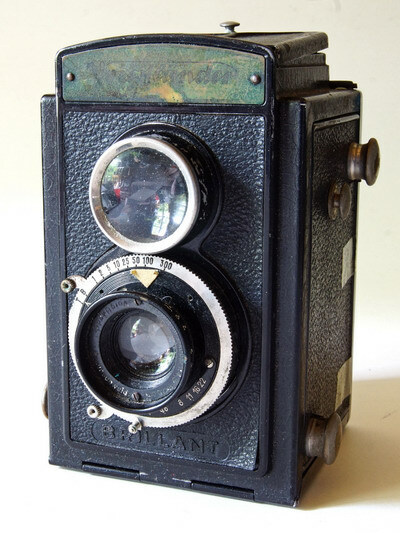 There is a bit of confusion about the actual manufacturing date because some lists say the shutter and lens serial numbers date the camera between 1947 and 1951 and others between 1934 and 1935, but the camera itself is clearly a metal body Brillant from the mid-1930s. It might well be the actual camera my grandfather was using to take all those photos before and during WWII – he used to tell a story that he had to take the lens off his camera after the end of the war so it would not be confiscated, which might explain the presumably newer serial number on the shutter and lens. This camera is, however, still the one he used at least well into the 1970s for 6×6 negatives and transparencies and as far as I can tell, it’s still in good working condition.